To buy or not to buy? That is a big conundrum for traders and investors alike this period. On a positive note, it is definitely clear that key market indicators are turning positive so far. The STI + HSI + Dow has already rallied some 5-10% from May/June's lows over the last 1-2 weeks, giving suggestions that it could be some time for some bargain hunting. After all, valuations were badly hit over the last 2 months. Furthermore, most large cap stocks have been leading the rally, in a fine display of strength from the market. Here comes the dampener - Europe is still in deep trouble and Spain is a huge economy that must not fail. Greece is still stuck in a political deadlock that has resumed this persistent trouble that was brewing since 2008. Moving to the US, its economy is still sputtering while the fiscal cliff from Bush's tax cuts looms large by the end of this year with no signs of a political will to persevere with it. But let's not forget that these pieces of news are already out in the vast open and really, it isn't that new after all. It is queer isn't it? For all the instability that Greece brings and the malaise in Europe and not-so-pretty-picture-after-all from US, all seems to be well with the market. Let's not forget that the market thrives on its very demand and supply principle; the premise is that markets are perfectly efficient, at least for the Singapore case. With that assumption, it is telling that the markets are making a positive stand towards reclaiming Feb 2012 levels, albeit cautiously this time, without much aplomb. It has been a really intriguing week with the markets responding on Monday to Greece and the follow-up today and I have been looking at a few counters that have been really catching my eye for this quick weekly update. 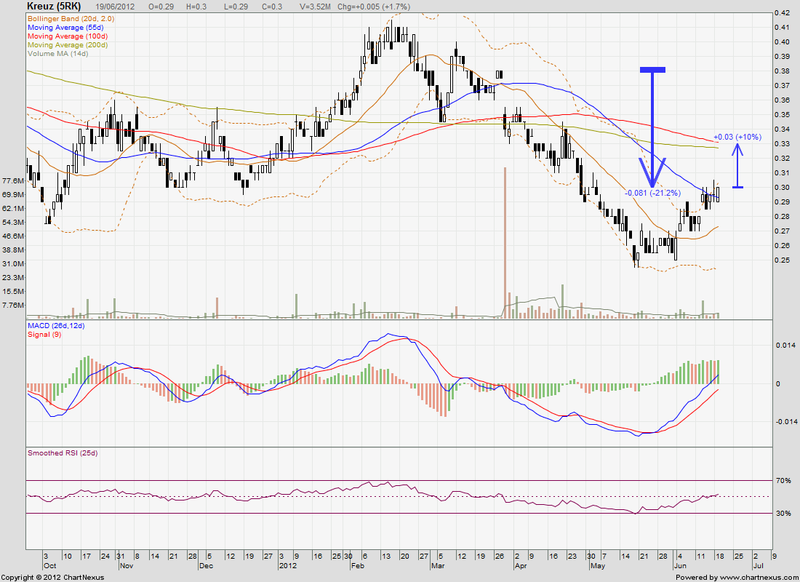 ST Engineering has rebounded over the last 3 days with 3 white big candlesticks appearing. Very positive sign indeed as it looks to recapture the April high of $3.16. From present levels, that is about a 5% upside still possible. MACD - Has increased tremendously over the last 3 days. RSI (25d) - Just crossed 50%. Very positive too. Bollinger Bands - Prices have yet to hit the upper bollinger band. 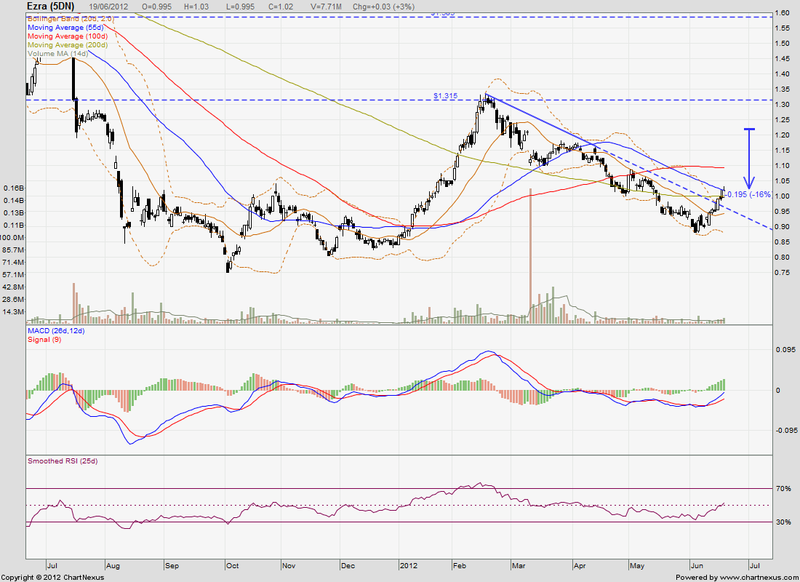 20d MA - Prices have crossed the 20d MA. 50d MA - Prices are now challenging the 50 and 100d MA lines. Any further cross will signal even stronger buying pressure. Volume - Note however that volumes for the last 3 days' white candlesticks has not really hit any resounding highs. Ezra has been joining in the market-wide rebound in oil & gas counters with really good days of huge surges in its price. After all, it had been a counter that was really battered down after Feb, losing almost 25% of its value in 2 months. MACD - Has increased tremendously over the last 7 days. MACD is also about to cross the 0 value, signifying even more upside being possible. Bollinger Bands - Prices have hit the upper bollinger band and seen pulling the bollinger bands wider. Even more volatility and potential upside for risk-takers to enjoy. 20d MA - Prices have crossed the 20d MA convingingly. 50d MA - Prices are now challenging the 50d MA line with little success today. It will seek to re-challenge it tomorrow. Volume - Nowhere compared to the year-start rally but definitely on an increase across the last 2-3 weeks. Kreuz share prices have seen a dramatic rebound from favourable news from its clinching of a project and analyst coverage over the last 2 weeks. It has been joining in the market-wide rebound in oil & gas counters.. After all, it had been a counter that was really battered down after Feb, losing almost 35% of its value in 3 months. MACD - Has increased tremendously over the last 2 weeks. MACD is in the positive region with some slight indication of some possible slowdown after this huge increase. Do keep an eye on the MACD as prices are now high and chasing the boat will require fast fingers to get out. 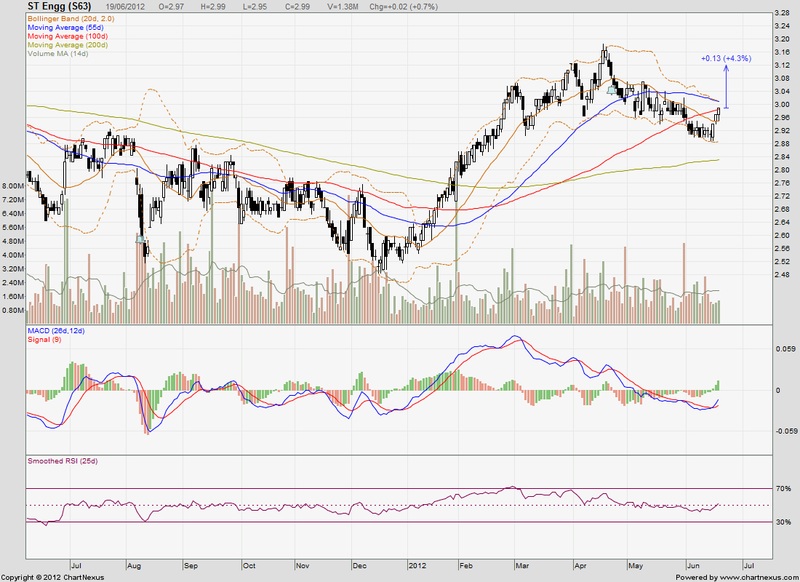 RSI (25d) - Just crossed 50%. Still positive. Bollinger Bands - Prices have been riding on the upper bollinger band and seen pulling the bollinger bands wider. Even more volatility and potential upside for risk-takers to enjoy. 50d MA - Prices have just crossed the 55d MA with some difficulty challenging it over the last 4 trading days. Watch this for more confirmation of further uptrend. Volume - First signal of even stronger buying interest came 5 days ago when its volume surged. Volume are still healthy relative to last few weeks.